Whenever a new beta for iOS is released, users who instantly want to download and try it out need to register to the Developer Program by Apple. Also, in order to download the beta, they are required to register the UDID of their device. When it comes to finding the UDID of an iPhone, it is very easy, as it can be found out straight from iTunes in the device Summary page. However, things get tricky when it comes to the Apple Watch. There is no Summary page for Apple Watch in iTunes, so how do you find the UDID of an Apple Watch ? Well, you can easily do so by using Xcode. Just follow the below-given easy tutorial to get the UDID of your Apple Watch. Note: Before proceeding, please make sure that your Apple Watch is paired to your iPhone. If not, then pair it first. Then connect your iPhone to your Mac through USB. Next, in the menu bar, click on Window > Devices. Now in the Devices sidebar, click on your iPhone. There will be a Paired Watch Information section, under which you will find general information about your Apple Watch. This information includes the name of the Watch, storage space, battery level, etc. There will also be an Identifier field in the information. 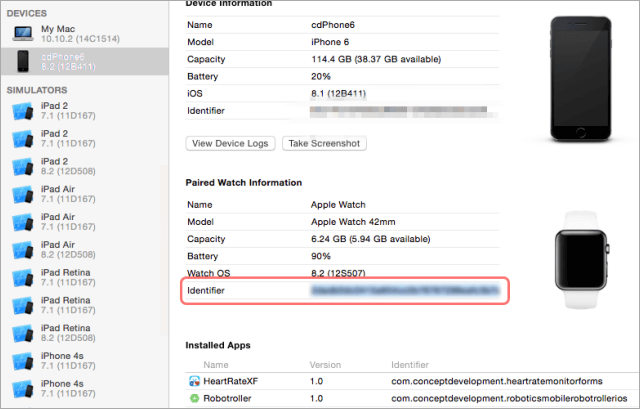 The serial number given as Identifier is the UDID of your Apple Watch. To copy the UDID, you can just right-click on the UDID simply. People may need Apple Watch UDID for several reasons. Some need it for access provisioning for a pre-release app, while some use it for UDID registration to try out WatchOS betas. In case you want to register your Apple Watch UDID, you will have to pay $99 per year to join the Developer Program of Apple.